Receiving documents are similar to packing slips; they show what items were delivered, the purchase order number if applicable, and the ship method. Additionally, they show who received the shipment, and where. These are most commonly used by Accounts Payable to match with the purchase order and invoice so that payment can be made. Your company must have Receiving Documents enabled in System Setup to access this feature. The lifecycle of Receiving Documents will be fairly short; generally, you will be creating them when items are received, and on saving, they will be closed. 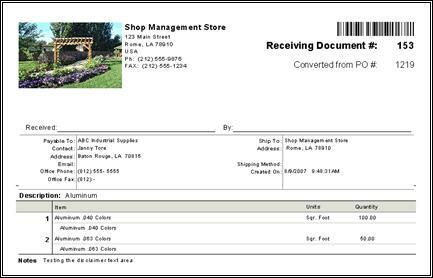 Receiving documents can be created in one of two ways, either by choosing New > Receiving Document and filling in the Vendor and item information, or by opening a Purchase Order and clicking Convert > Convert to Receiving Document on the right of the screen. When you click save, the system will let you know that all items associated with this purchase order have been received and ask if you want to close the purchase order; choose Yes or No. For the occasions when you receive the items and the invoice at the same time, you can create a Receiving Document from the Bill. Enter the Bill as you normally would and save it, then on the right of the screen click on Convert to Receiving Document. As above, if you have created the Bill from the Purchase Order, when you save, the system will let you know that all items have been received and ask if you want to close the purchase order. The Inventory system in Control does not account for accrued inventory, meaning that inventory received but not yet billed is not accounted for in the financials within Control. 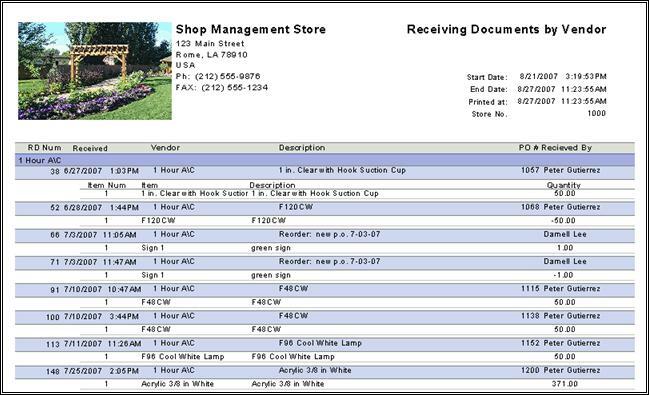 The accounting for inventory received from your vendor is posted to your financials when the bill is created. There are a few different options for this report; you can view information by Vendor, Part, or Receiver.